How times have changed: the loudest voice at the Republican National Convention wasn’t an oil conglomerate or SuperPAC; it was a tech company, Google. 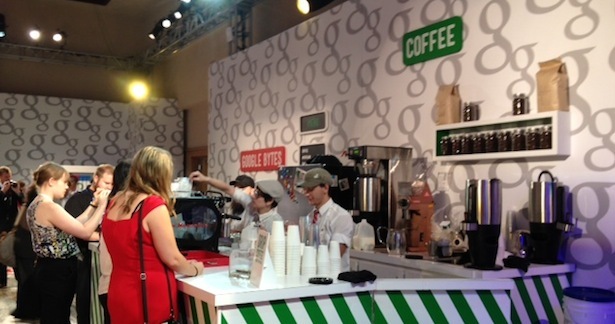 A free coffee shop, blazing-fast Wifi and a broadcast studio was enough to make Google’s swanky convention digs the hip hangout spot at the conservative quadrennial mecca. Google’s hangout is a like a Starbucks working space on steroids: Internet speeds clock in at a whopping 60 megabits per second, there’s an abundance of powerstrips, and the free custom latte’s are served up just as quick as the paid coffeeshops. The appealing benefits reel-in influential staffers for a captive audience in front of Google’s tech. Of course, Google is using the space to show off its products: The Google search trend tracker of keynote speeches, the Google crises map for Hurricane Isaac, and the magic of Google ads. The entire google-extravaganza encircles the RNC’s official YouTube-live stream, where notable conservative pundits, such as Fox News’ Juan Williams, have dropped by to offer their take on the horse-race coverage. Perhaps more importantly, Google is not shy about promoting its policy interests. A center rack prominently holds a pamphlet for Engine Advocacy, a new pro-technology political think tank. Google wrote a check with a lot of zeros for the prime realestate, but with the technology sector competing with perennial competitors like manufacturing and agriculture for mindshare, it’s given everyone in Silicon Valley the loudest voice at a very important political gathering.